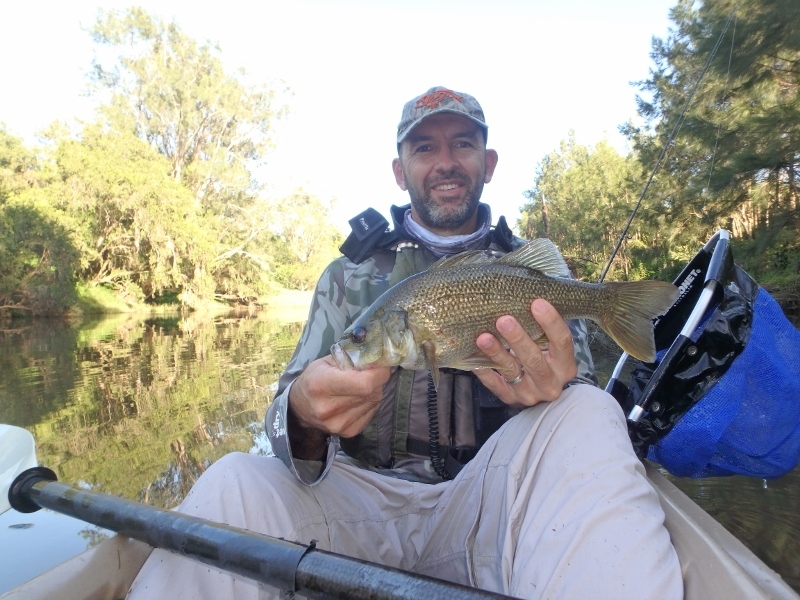 With the curtains of the school holidays slowly closing I was keen to head out on another full day chasing bass. 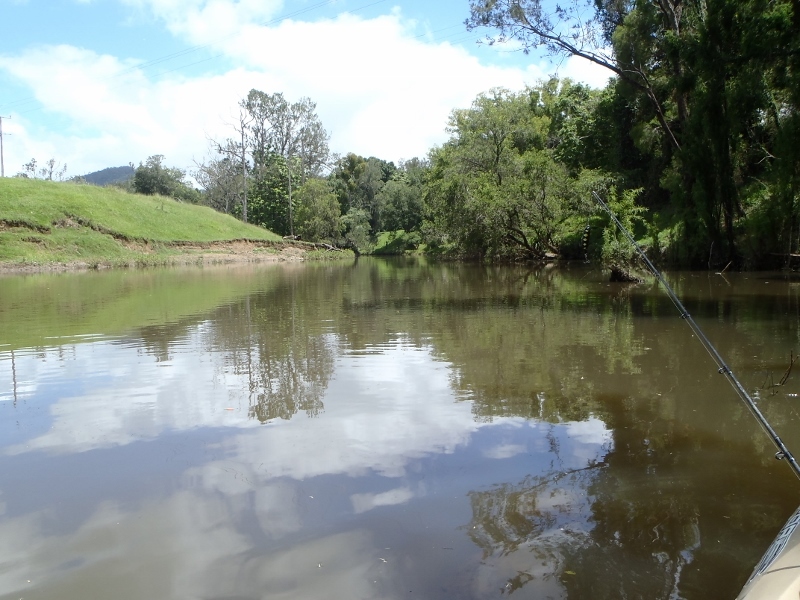 I wasn’t so keen to fish the weekends and wanted to at least spend a weekday chasing bass with a minimised chance of finding someone parked at my Chosen location. 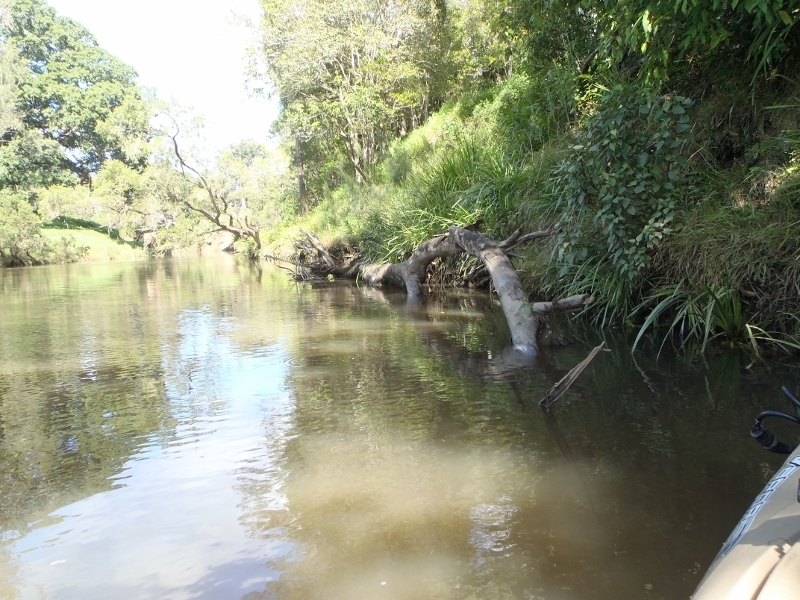 At so it was I headed of on a Monday to a section of a river I had not fished since last season. 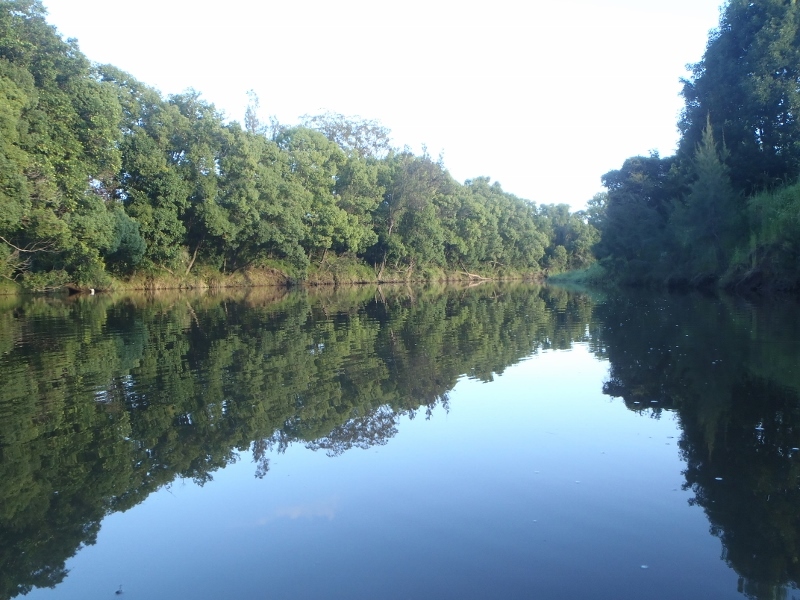 Over the years it has become much more popular with swimmers and although I have still managed to fish it alone on most occasions, it has not given me the peace and tranquility I chase when I had out on these trips. So as always it was an early morning start and in truth I was hoping to be on the water in the dark but sadly I arrived just as twilight started. Arriving at my launch point I was dismayed to find another car parked in my usual spot and initially turned around to head somewhere else before changing my mind. A second look at the van with its curtains closed and I decided it was just someone sleeping rather than kayaking and fishing. I quickly launched and headed straight across the river to the first structure. 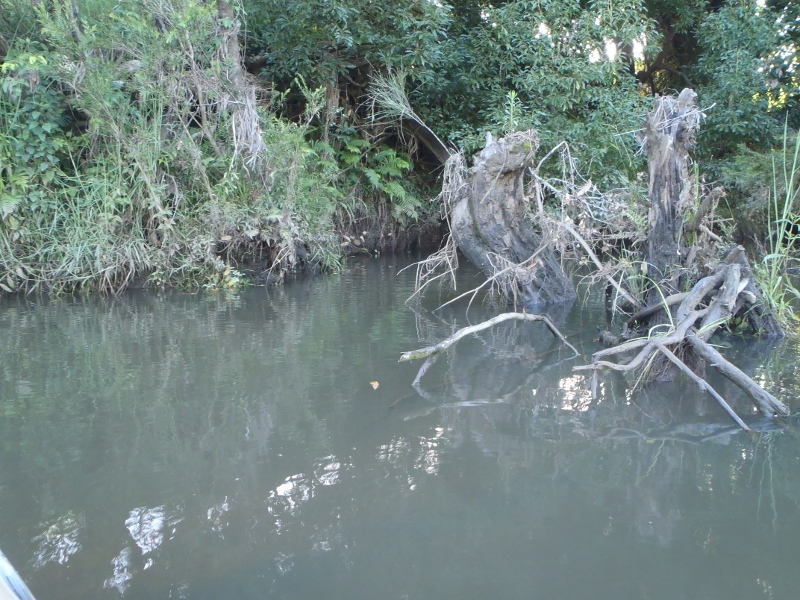 This was a Callistemon tree that had its trunk running parallel to the water line and had been here since I started fishing the river over 10 years ago. 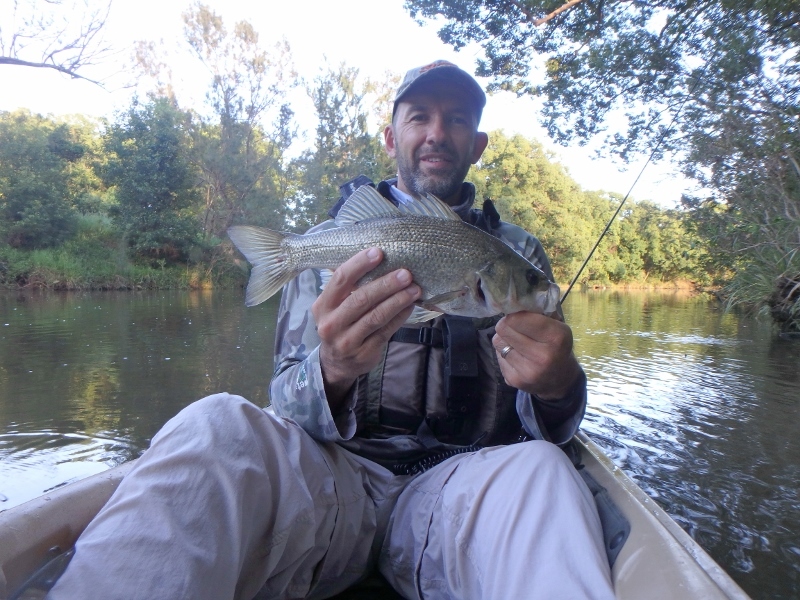 It has reliably yielded me a first cast fish on so many occasions and even gave me my very first surface caught bass. On this occasion it yet again rewarded me with a bass on my first cast. 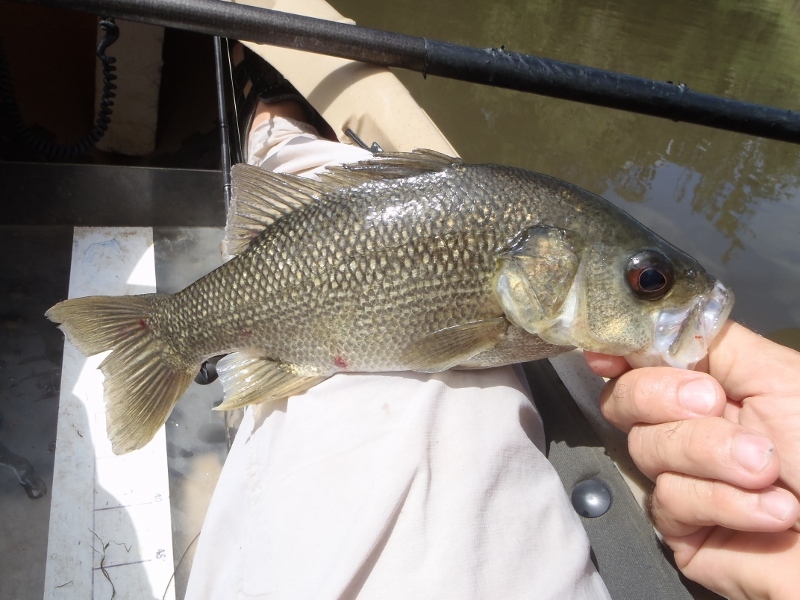 Sadly the 35cmFL bass was in terrible condition and had a belly that was paper thin and skin that was covered in sores. 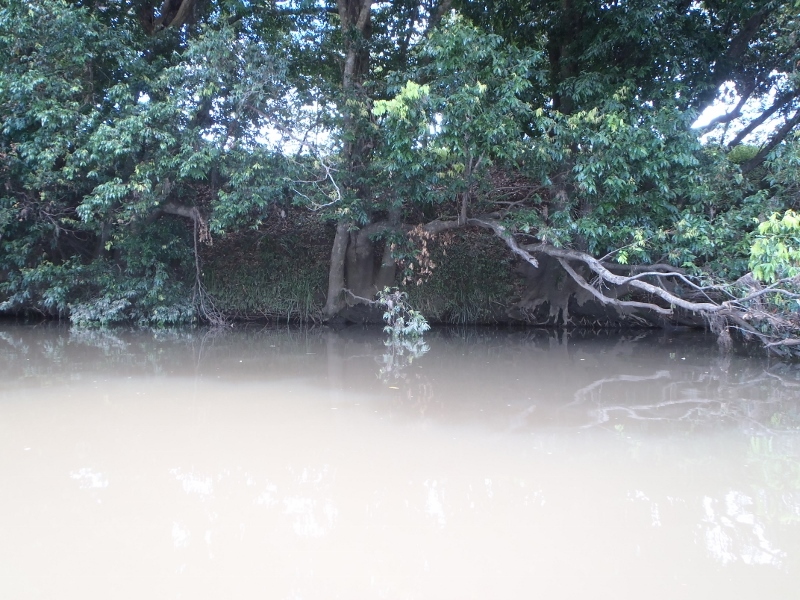 It was a sign that the river had been in stress in recent weeks and although the water level was higher than it had been in ages it was clear that it had been much lower. The first cast had made me highly optimistic of a cracking session and an hour later my emotional state was the reverse. I did not get a touch and as the sun rose the colour of the river eventually became a muddy colour much the same as a milky coffee. To make matters a little worse ever structure was covered in a filamentous weed that had obviously been ripped up in recent flows. I had chosen this system in the hope that the heavy rain in the previous week had given it a good flush but it was clear that weed had not been fully removed from the system. It was also apparent that the river had had a second big flow in recent days that we had missed out on more locally. 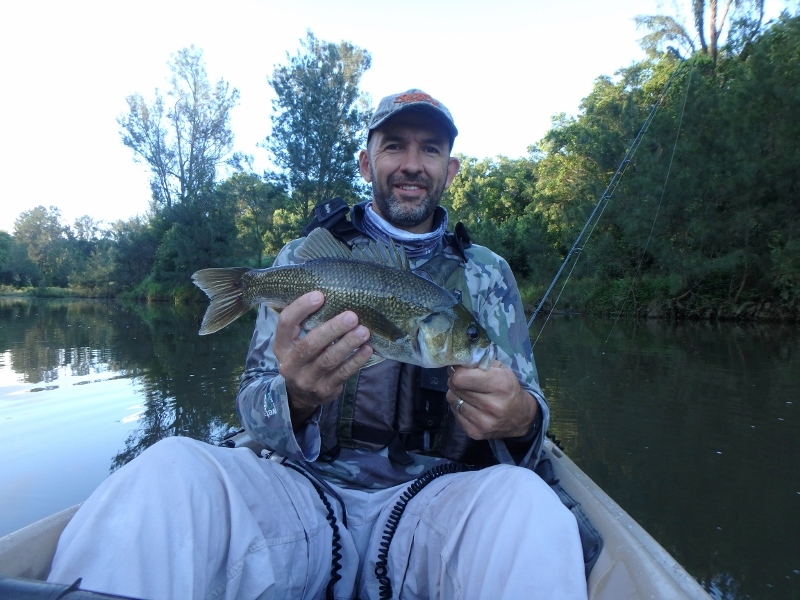 Eventually I bit the bullet and decided to head to the top of the pool in the hope the bass had been encouraged to head upstream with the recent water flows. 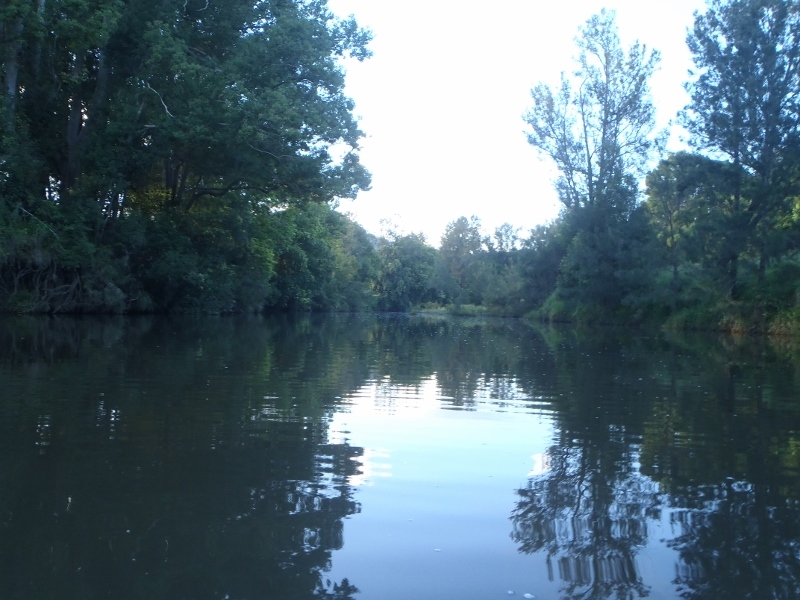 I paddled a fair way without casting and only when I reached the last 100m where there was some current did I continue to cast. 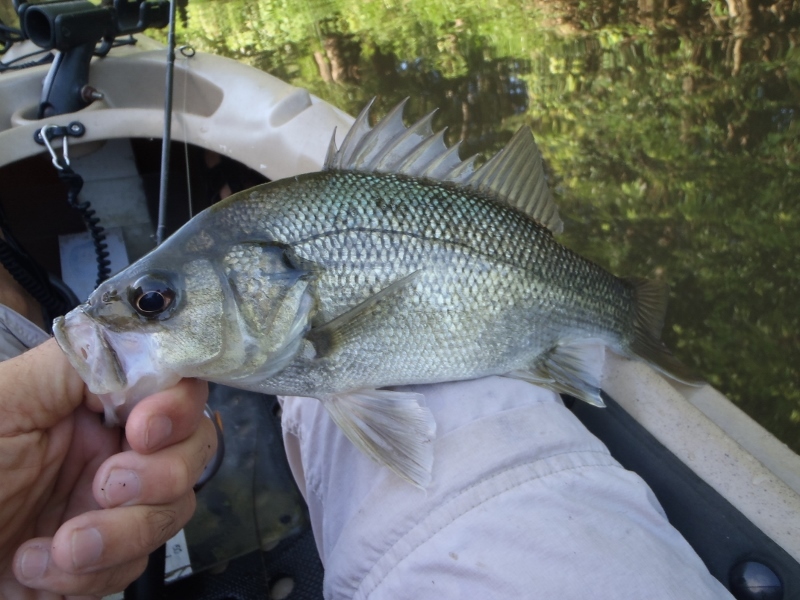 Soon after a cast at some exposed roots where the current pushed up hard against it was smashed by a good fish and after a spirited fight I netted a 36cmFL bass. 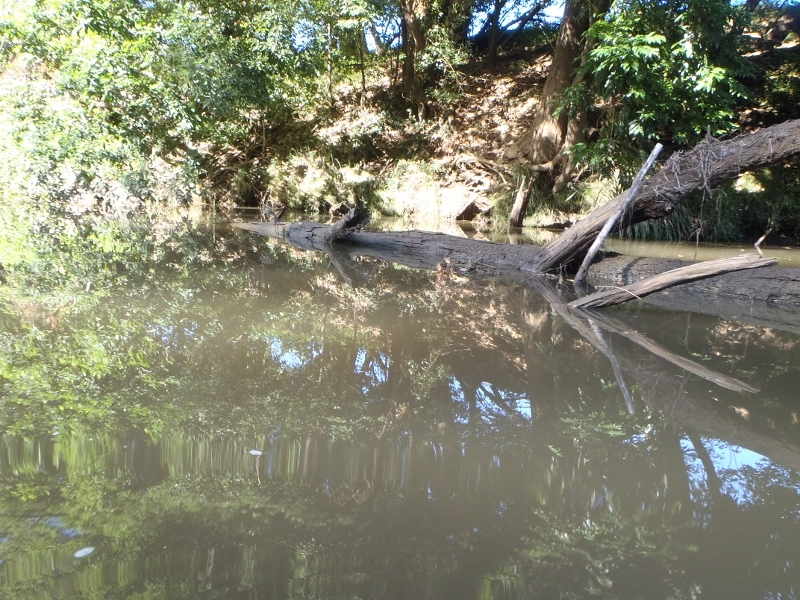 This was the encouragement I need to continue on upstream, and when a cast beneath the shade of a fig tree was smashed 5 minutes later, and I netted another 35cmFL, my confidence was restored. Now on many other visits to this system the launch pool has fished poorly and once I portaged to the next pool I have found the polar opposite. 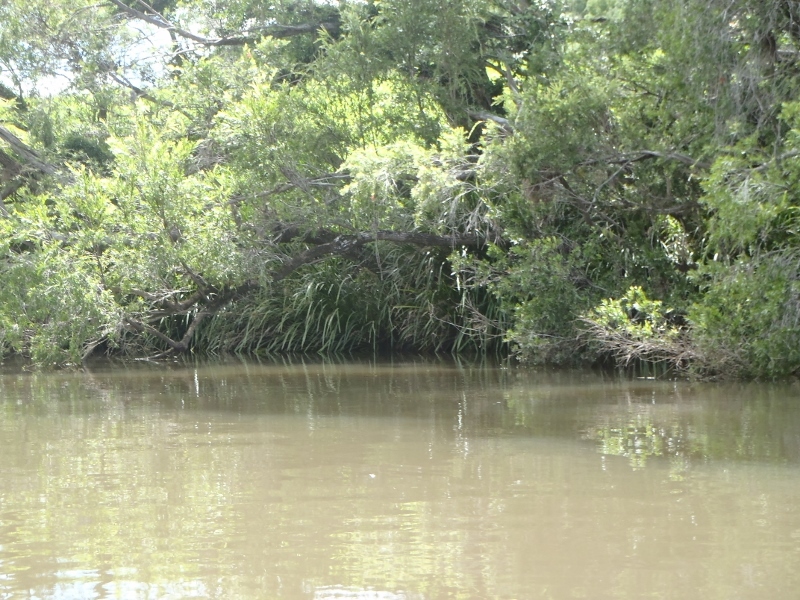 As a result I was quietly confident of finding a few more fish lurking in the familiar structures. 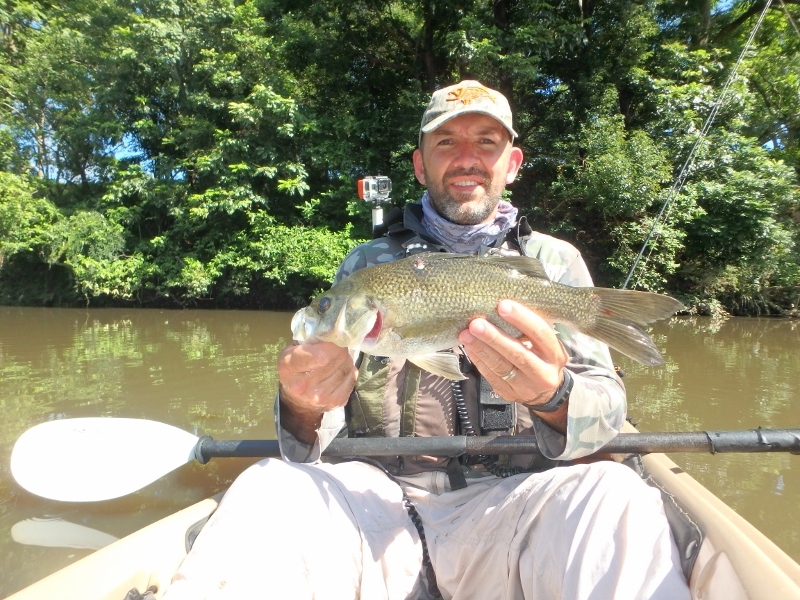 It wasn’t long before a cast at an eroded bank was met with a solid “thok” and the bass missed the trebles without a second glance. Soon after a long retrieve from a massive fallen tree was hit almost back to the yak in full sunlight and my complacency resulted in me striking way to early and missing the bass. Both would have been easy fights and it wasn’t until I cast in between about 4 massive lay downs that my lure was smashed and I was in trouble. The bass headed for cover and I was quickly stitched up, luckily he wasn’t a huge fish otherwise it would have been all over red rover but at 34cmFL I could easily paddle in and extract the fish. 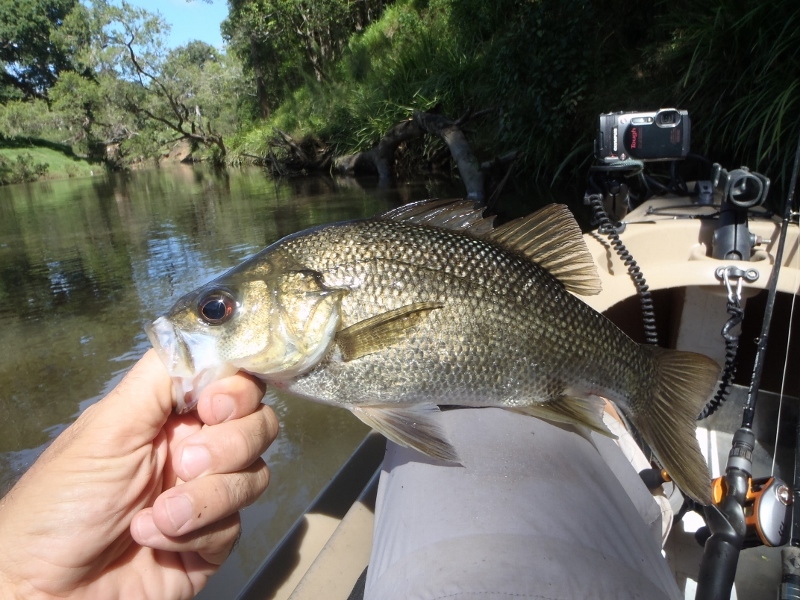 With the fishing improving I decided it was time to get out the GoPro and after a few casts I was rewarded when a bass hiding beneath a massive Lomandra sedge hit the lure and tried to tear off for cover. 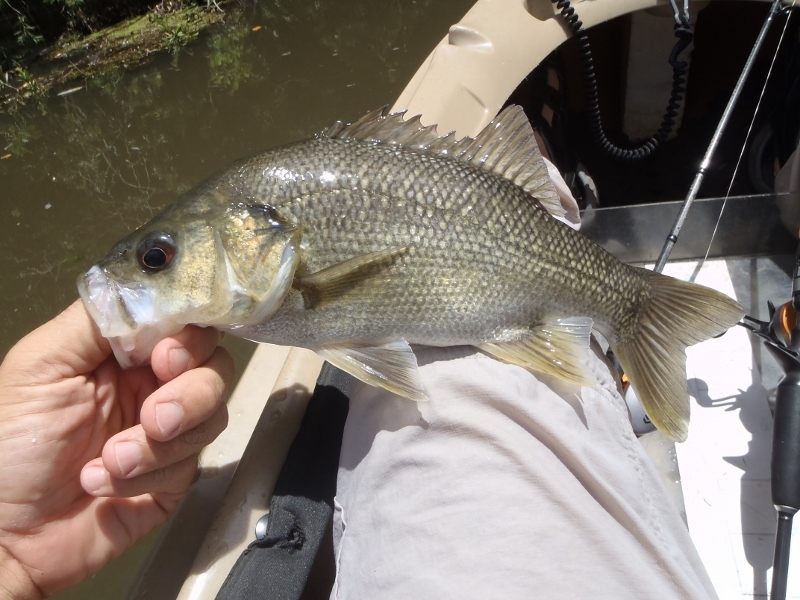 The great thing about bass in this system is the fight they have and although they were not at their best in the poor conditions they still knew how to flex their muscles. 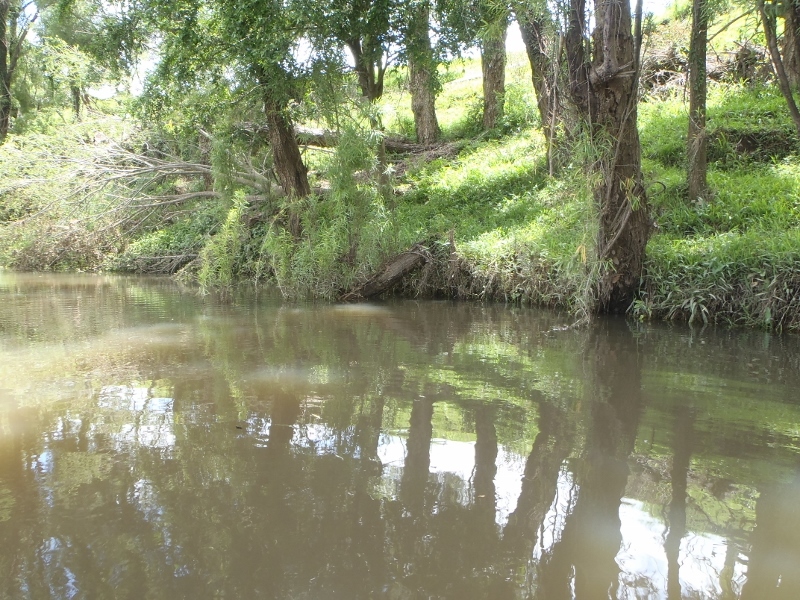 As I continued to cast along the more obvious shady side of the river I quickly noticed the line of sunlight creeping down the tree line on the opposite side and approaching the waterline. 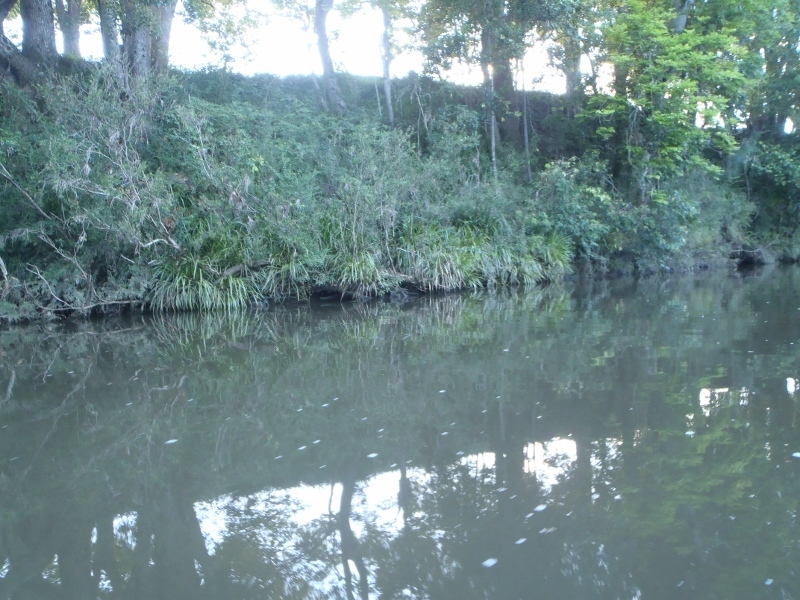 I really wanted to cast at some heavily timbered sections on the opposite bank before the sunlight hit the water and lowered my chances of a few hook ups. So I abandoned the more picturesque bank knowing that I could return later as it wouldn’t be until midday that it was light affected. 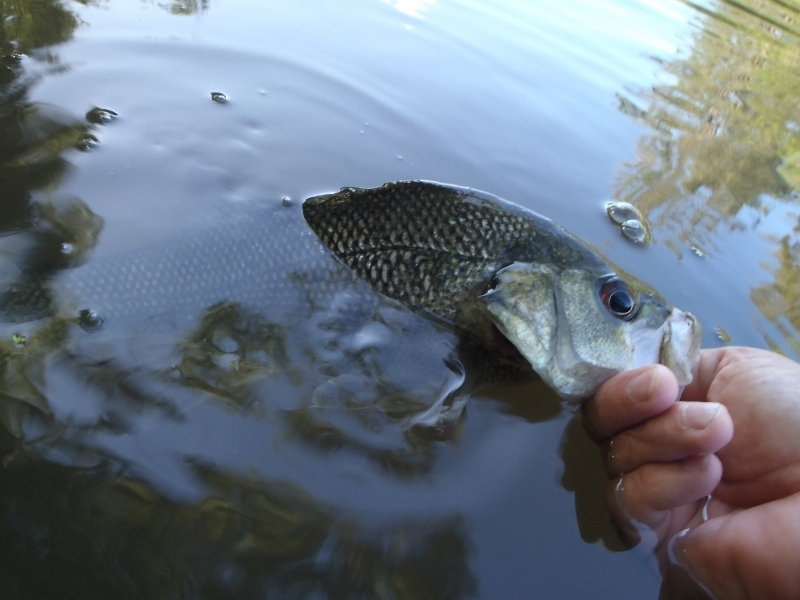 It wasn’t long before a cast at a lay down long parallel to the bank was hit and I was into another small bass. This scene played out twice more in a small time frame and I managed to capture all the hits on the GoPro as well. I then managed to miss successive fish and two of these were much bigger than the bass I had caught in the morning so far. One of them completely missed never to return and the other I pulled the hooks on very early in the fight. 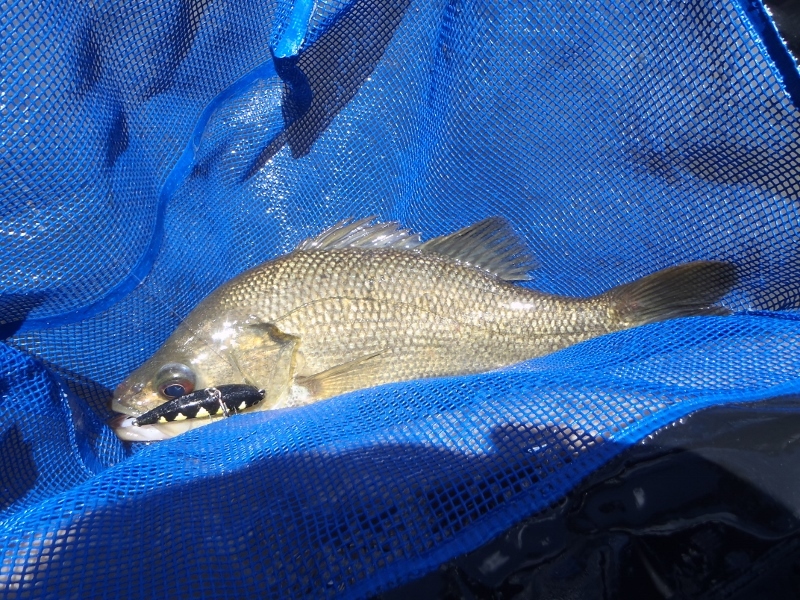 I then managed another 30cmFL+ bass on a nice laydown parallel to the bank and in some nice shade. 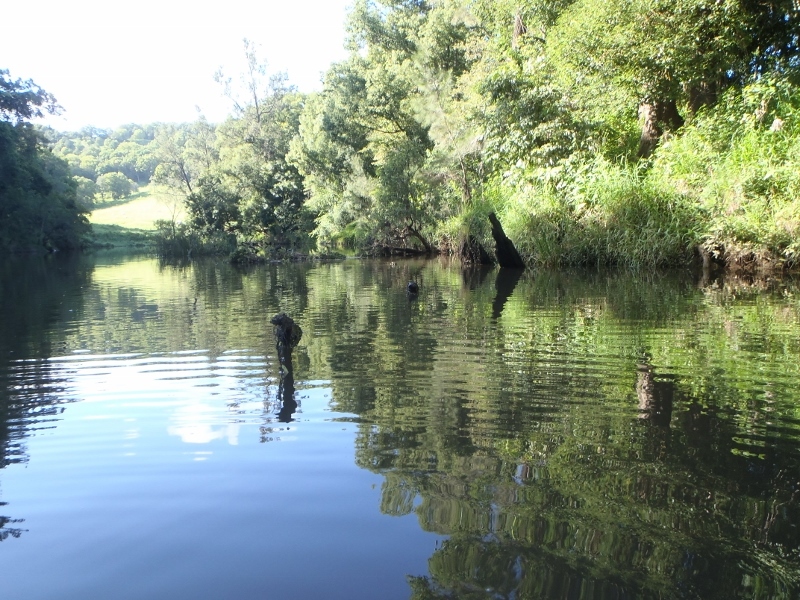 I continued upstream and caught bass regularly and missed plenty as well. 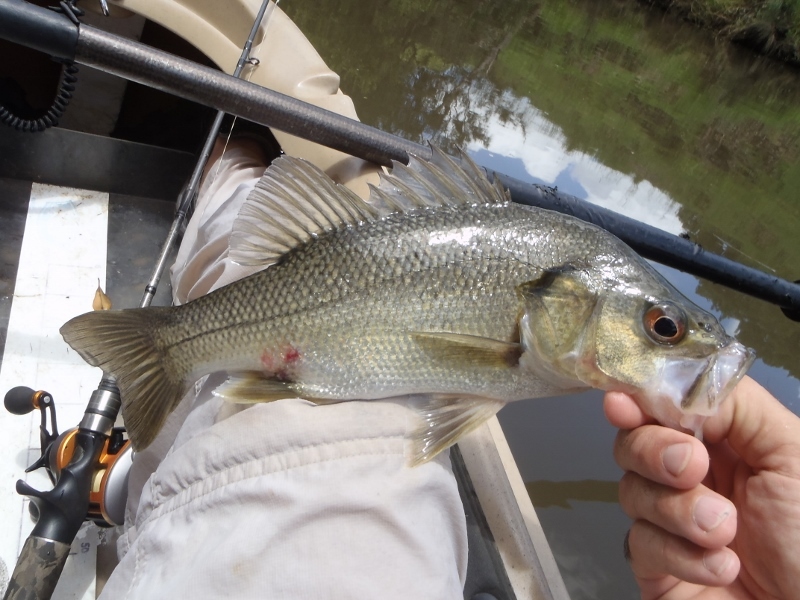 My biggest bass for the session came out of a thick tangle of fallen timber and Callistemon trunks and although at 37cmFL it was the biggest bass of the day it didn’t fight like it. 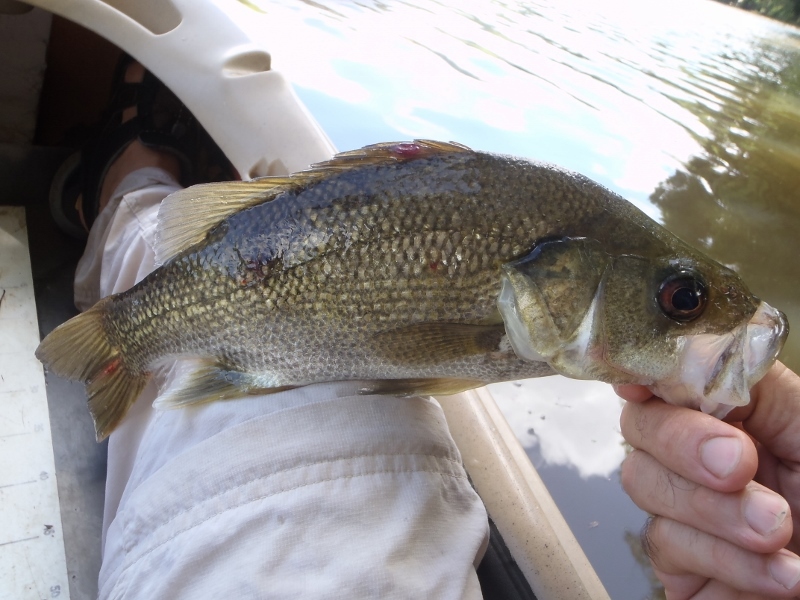 Like a few of the other bass on the day it was covered in ulcerated sores and had clearly not been feeding. On one snag I hooked up and then dropped a fish only to hook up to a second fish on the follow up cast. 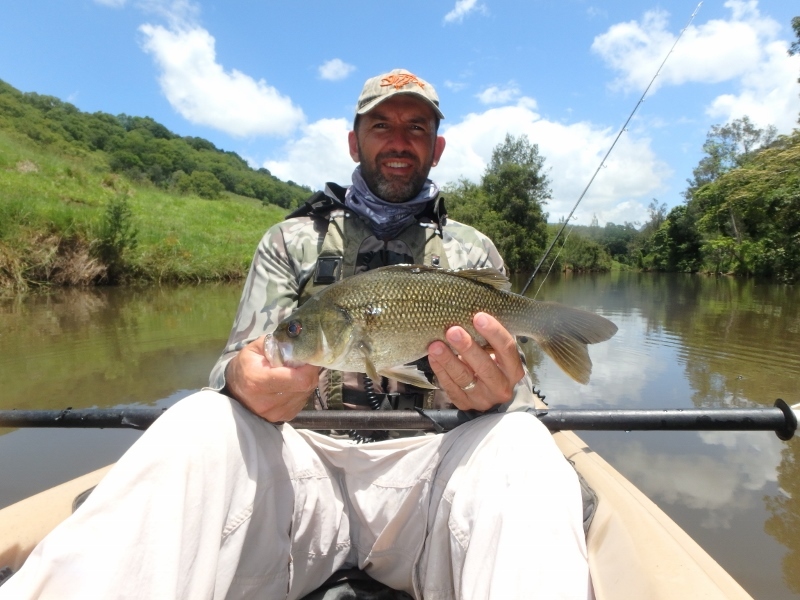 The next cast a few metres up was then smashed by a cracker of a fish that was a one hit wonder. 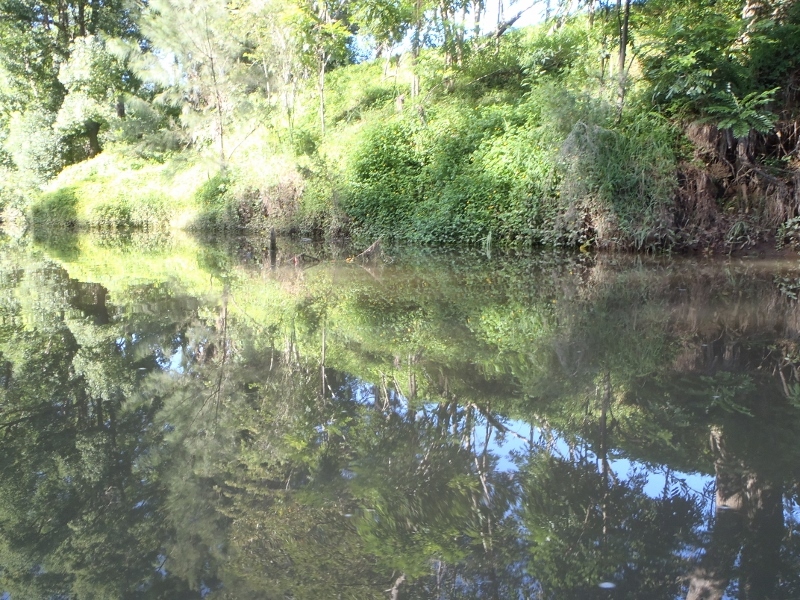 The further I paddled up river the slower the fishing got and at one stage I passed 3 pools without a touch. 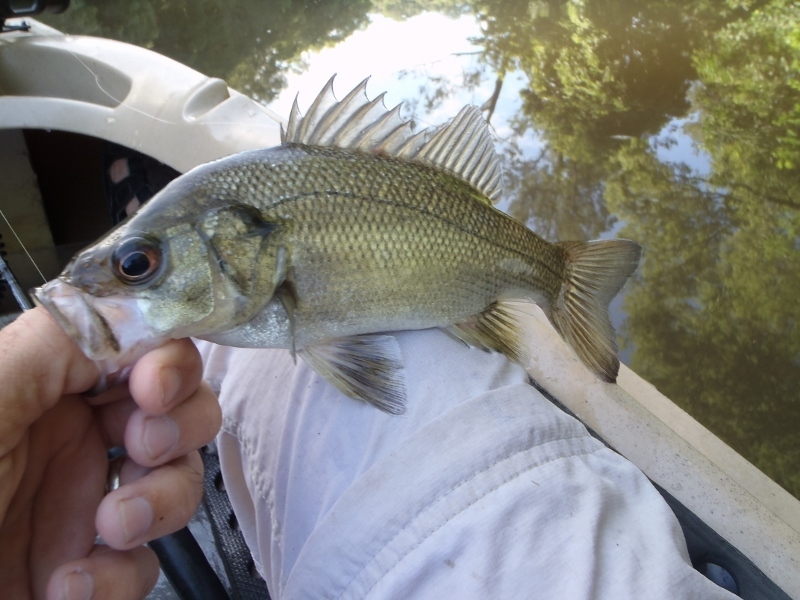 At the last pool I managed a 35cmFL bass that missed the lure on its first pass only to nail it on the second and, and then I managed a rat before I turned around to head downstream. Of course the paddle downstream also coincided with a dramatic increase in the wind speed that just happened to be blowing in the opposite direction to which I was going. 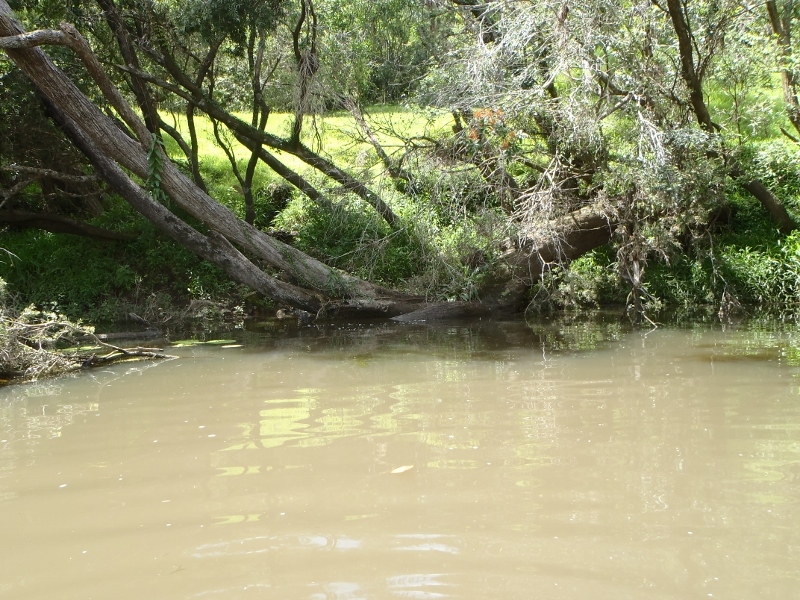 It always amazes me how this happens at the end of a long gruelling paddle upstream. At this point the sun had passed its zenith and parts of the river previously exposed to the sunlight were now shrouded in heavy darkness. 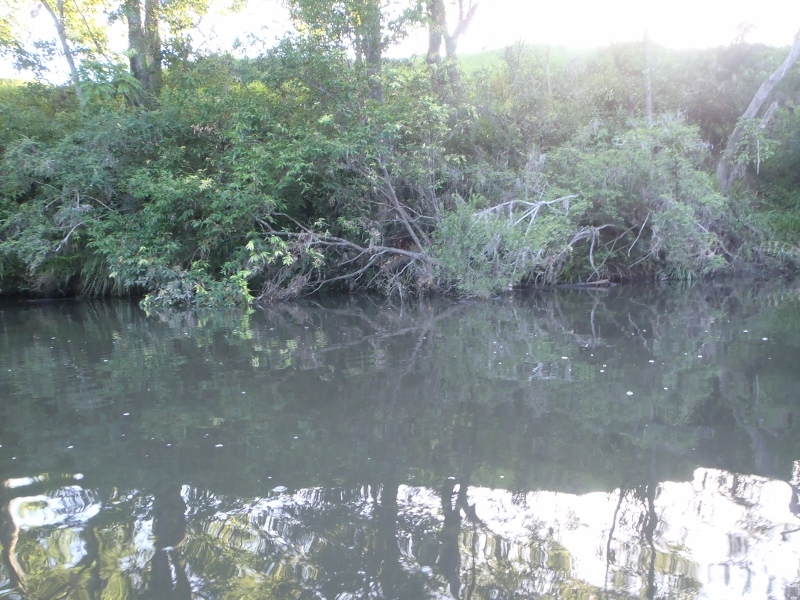 One particular set of timber was now a perfect ambush site for a light shy bass and I managed two in quick succession casting into the shaded canopy. One was a rat and the other was a batter fish at 36cmFL. 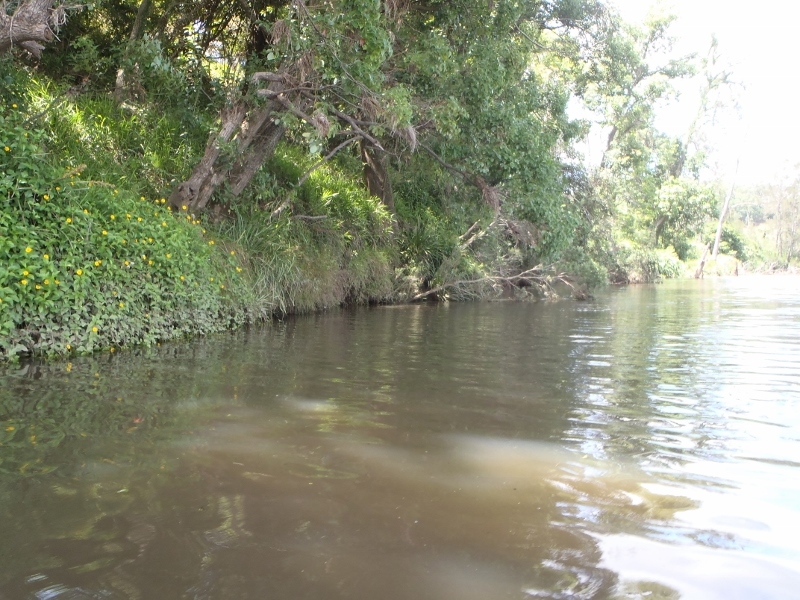 I reached the launch pool and the wind was blowing hard amazing paddling and casting extremely difficult. 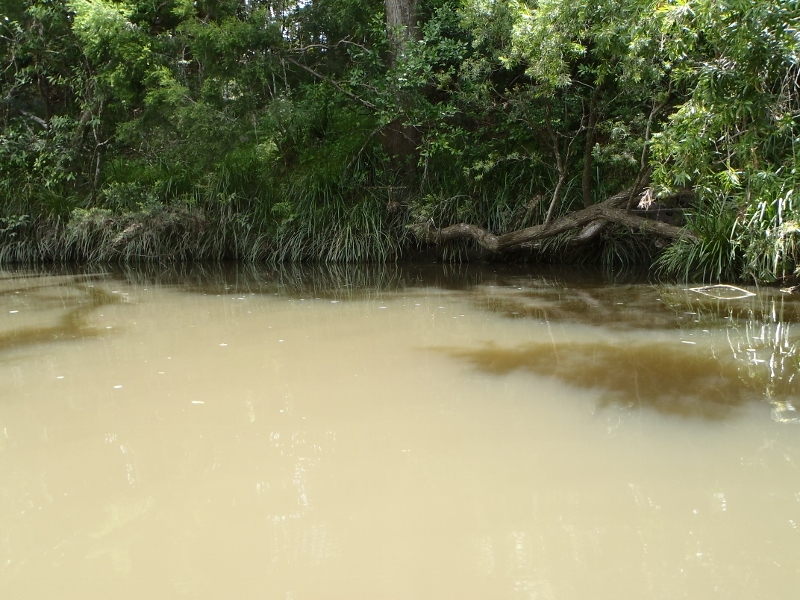 I had hoped to fish the shaded part of the river on my return journey but I was only able to get a few casts in in the deteriorating conditions. That said I still managed to find a few interested fish and hooked one more 30cmFL bass and dropped another as I headed for the car. 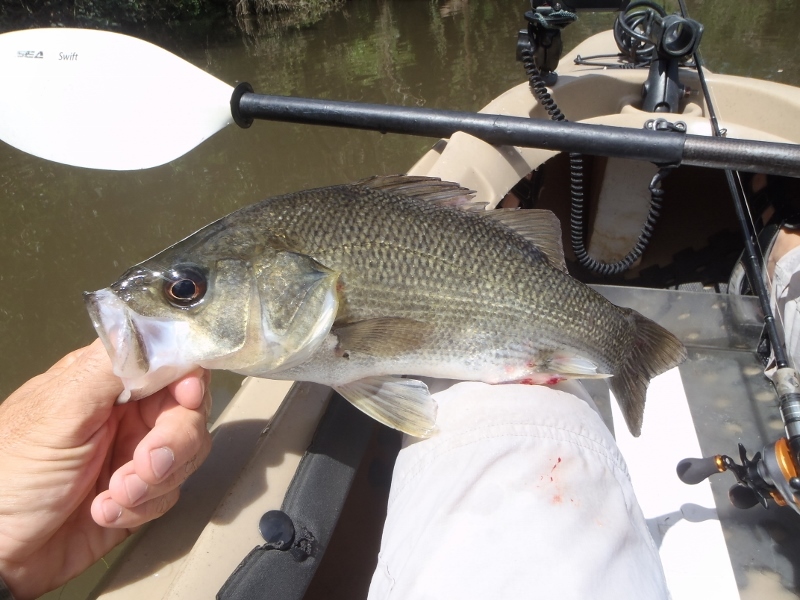 By the time the kayak ran aground on the gravelly bank I had managed to net 17 bass and all of them off the surface on a Luckycraft Sammy 65 (Archer Bee) as well as missing many more. It was a great session but the fish looked like they were in recovery mode after a rough last couple of months. I think I will let them be for a little while and allow them to improve their health before I visit this system again.